The government has further announced that the tax holiday will now be offered to new investors in all business sectors in the country. 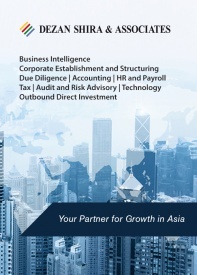 Previously, it was available to investments in any of the 17 pioneer industries including transportation, telecommunications, robotic components, oil and gas refinery, train engines, medical devices, pharmaceutical raw materials, power plant machinery, and processing of metals and agricultural products among others. Pioneer industries are those that create added value, introduce advanced technology and have strategic value for the national economy. Originally, the provision was available to only eight such industries. Under the latest regulation, the newly established companies with a minimum investment of Rp500 billion (US$36.4 million) can avail 100 percent CIT exemption for a period in proportion to the scale of their investment. Investments starting from Rp500 billion (US$36.4 million) up to under Rp1 trillion (US$72.5 million) can enjoy exemption from CIT for the first five years, while those investing more than Rp30 trillion (US$2.2 billion) can enjoy a maximum CIT exemption for 20 years. 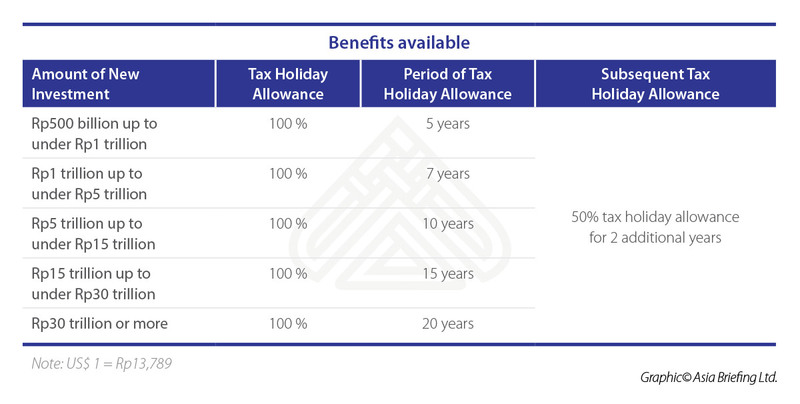 In addition, investors can enjoy a 50 percent tax cut in the transition period of two years, following the expiry of the initial the tax holiday. 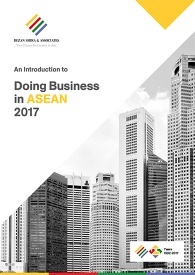 Earlier, the rate of tax allowance varied from 10 percent to 100 percent for a maximum of 15 years, and only those companies with a minimum investment of Rp1 trillion (US$72.5 million) could avail such benefit. It must be an Indonesian legal entity. 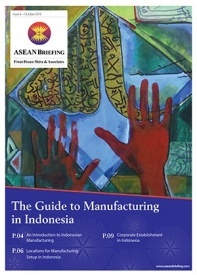 The application for the tax holiday must be submitted to the Indonesia’s Investment Coordinating Board (BKPM) either during the capital investment registration or within one year after the issuance of capital investment registration.The recent regulation has removed a special committee stage wherein businesses’ impact on the economy were assessed, thereby reducing the application procedure to just five working days, instead of the previous 45 days. More incentives in the pipeline? 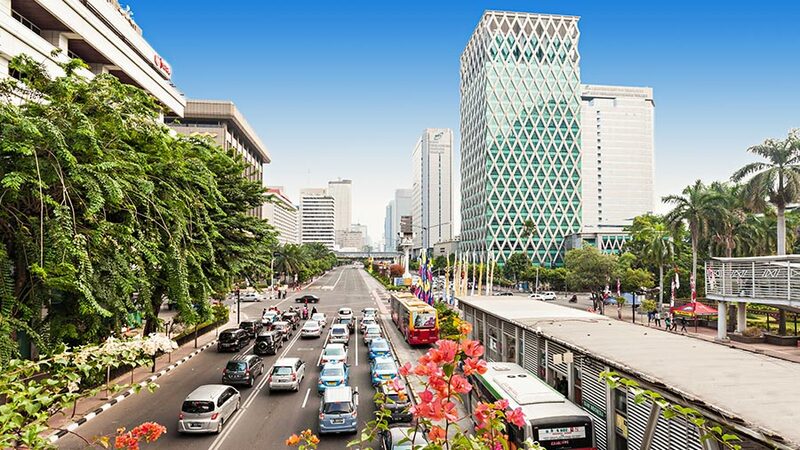 Boosting investment is a priority for the Indonesian government, given the current sluggish growth of the economy. As a result, in addition to easing tax holiday policy, the government has recently scrapped a number of regulations restricting foreign ownership in industries such as pharmaceutical raw material; abandoned 22 out of 51 rules for business licenses in the energy sectors such as oil and gas, mineral resources and electricity to boost investment in the sector; and eliminated counterproductive provisions that often subject businesses to overlapping taxes. In the coming days, the government also plans to offer tax deductions to small and medium-sized enterprises (SMEs) and income tax deductions of up to 200 percent for companies carrying out R&D activities to boost investment in the country. Editor’s Note: This article was first published on April 19, 2018 and is updated on October 12, 2018, as per latest developments.